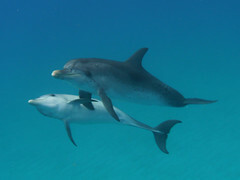 In 2008, I went on an adventure that turned out to be an “adventure of a lifetime.” I went to the Bahamas and swam with the dolphins on a eco-trip called Dolphin Expeditions. It was facilitated by a teacher of mine, Penelope Smith, who has taught me many things and ways of communicating with animals. Little did I know, what happened that week would stay with me for the next three years. I’d been drawn to swim with wild dolphins for years before I actually went. I wear a silver dolphin charm on a chain around my neck. I read about the dolphins and their special families whenever I find something new and exciting. Before this trip, I had only “met” one dolphin who was in captivity. But the light in her eyes stayed with me. Penelope Smith, who is a world renowned animal communicator offered this journey, but I was one of two animal communicators in a group of twelve. Two of us may have experienced animal communication before, but most everyone in the group received a special message from the dolphins. And when I returned home, the first question everyone asked me was “what did the dolphins say to you?” Well, they didn’t really say anything. The experience of being in the water with them was so overwhelming that there was no chit-chat. I was in their world and they gave me plenty. It’s funny to me when people tell me, (the one who was there) that “dolphins are aggressive and dangerous”. Because my experience was exactly the opposite. I have never been surrounded by so much love in my life. The dolphins I encountered were curious as to who we were But there was never any fear. I was “checked out” carefully by several dolphins and felt and heard their “clicking” sounds as they swam around me. I felt a surge of light pass right through me – a small electric current. We were urged to swim with our arms at our sides, using only our fins to guide us through the water. The more still and “open” we were, the more the dolphins were likely to come to us. And it worked. Only sometimes one of the group would squeal with delight. Human and dolphin alike. It was over-the-top, amazing. The crew was even thrilled to encounter the dolphins and this is what they do for weeks all year long. I’m not very good at guarding myself from intense energy. I am very open and don’t always protect myself from the emotions and feelings of others. We all have energy that we emit and receive. Animals and humans. Some of us are more aware of it than others. I don’t do well in large crowds and it’s been theorized that since I’m psychic I pick up on all the energy flying around me: anxiety, stress, joy, fear, happiness, love – the list is endless. You can find all of these in any given group in any given place. I take it all in and don’t sort it out very well, but I’m learning. 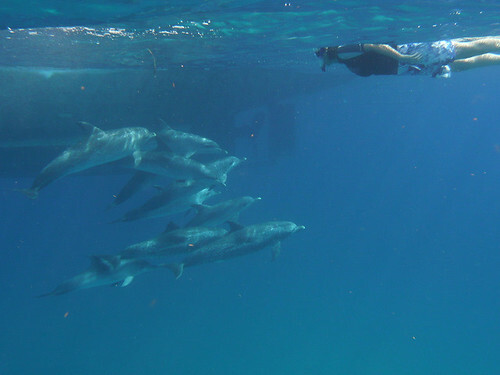 It has enabled me to learn and experience amazing things – like the dolphins. And it’s made me nuts – like shopping just before a holiday in a grocery store. I feel it all. Living in a rural area helps me to cope with the scant humans around me. I do much better with animals. And I did really well with dolphins. We stayed 4 nights on the boat. We woke to the light blue waters of the ocean and swam in the water just after breakfast. We swam almost everyday with the dolphins and the experience changed me. Not one day has passed since then that I don’t find myself, eyes closed, remembering their special love and message. It wasn’t a verbal message, but a “knowing” that anyone who has swam with wild dolphins will identify with. They are definitely from another place than humans. They embody the love we all strive for. And their light is blinding. And this may be the year I return. I can feel it. I want to go back on the same boat and visit the same dolphin family I met three years ago. And I want to go with the friend I met on the boat. We met the first day and never stopped talking about our experience. We talk a few times a week by phone now since we’re separated by a few thousand miles. I am smiling as I write this because I am almost sure that this is the year we will meet again and in our favorite place. I have a feeling the dolphins we met will remember us. Each night as I fall into sleep, I call them to me and say good night. And each night I dream of being back with them again. 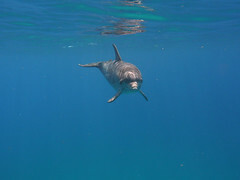 This entry was posted in Animal Communication, dolphin expeditions, dolphins, Lisa Fraser, Penelope Smith, pet psychic, swimming with wild dolphins and tagged Animal Communication, Dolphin Expeditions, dolphins, Lisa Fraser, Penelope Smith, pet psychic, wild dolphins by Lisa. Bookmark the permalink.